Michael Che And Colin Jost On 'SNL,' Hosting The Emmys And Hating Twitter The SNL head writers have different attitudes toward co-hosting the Emmy awards Monday night. Jost admits to being nervous, but Che says, "It's comedy! ... There's nothing to be afraid of." 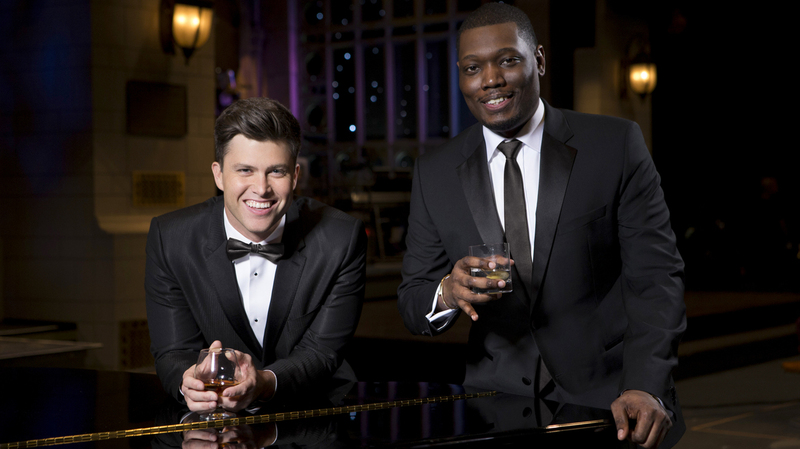 Colin Jost and Michael Che will host the Emmy Awards on Monday, Sept. 17, on NBC. Che, meanwhile, takes a more laid back approach to the show. "You can't be nervous. It's comedy," he says. "If I was a fireman I'd be scared. Firemen should be afraid. ... But for comedy, we're literally going out there and we're just going to tell some jokes and people are going to like them or not. There's nothing to be afraid of." As co-head writers for SNL Jost and Che are used to the high pressure. "Head writer" sounds like a great and lofty title, Che says, but it's really more of a supervisory role — someone whose job it is to think about the show overall. "We're competing to get stuff on just like any other writer," he explains. "You don't walk around with a big ol' cigar or anything like that." As for what being a head writer means to Jost? He answers: "Great question, we would love someone to explain it to us." SNL is up for 21 Emmys — including a the award for outstanding writing for a variety series. Colin Jost: The first part [of the show] is usually the part that's figured out last, which is what makes the job stressful. Michael Che: Because the news cycle is so quick now that what seems relevant Monday probably won't by Saturday. Jost: [SNL executive producer] Lorne [Michaels] always talks about how the first 15 minutes of the show are the most important, because if you're tuning in, that's your real chance to hook a viewer. The monologue is such a tricky thing always, because you want to show off who this person is, maybe in a way you haven't seen them before ... and the cold open is such a different animal, and that's constantly shifting. The number of weeks where the cold open and the monologue are both even vaguely figured out before Thursday, it almost never happens. If it does, you just cross your fingers that those will hold up by Saturday. Che: [It was] working with an unfunny, insecure dude. ... For me, I don't mind anybody being on the show, because I think something good can come out of anything in comedy. But I wouldn't go for it [again]. ... I don't know what the "win" is. I don't think people find him funny. Jost: The next day when we were there for the table read, [Chappelle] was like, "The reason you're in comedy is to react to things that are going on and make them funny, to find humor even in whatever's the weird, darkest things. You have to figure out how to still put on a comedy show, because that's why you're doing this." I think that was just the right motivation for everyone to try to put a show together by Saturday that was still a comedy show, and I think that was reflected in his monologue really well. Che: I truly think him going onstage and not addressing anything was insane. I don't fault the attempt of making it right; I do fault the execution of not making it right. I think everybody has the right to defend themselves. Everybody has the right to take the opportunity to clarify or apologize or make any bad situation right, but when you don't do it, you can't — it's indefensible. Che: I don't like Twitter, because no one is as angry as they say they are and no one is as happy as they say they are. It's just kind of this land of hyperbole. I have a platform. We go on TV and we're lucky enough to be able to tweet to a camera. It's not for me. I just don't like the way it makes people feel. I don't like the way it makes people gang up on other people — justly or not, it's just uncomfortable. I don't like it at all. It's just a cesspool of everybody just yelling at each other. Anger and extreme joy are the only voices that get heard on Twitter. Jost: It also used to have a great function, because you'd follow comedians or your friends who were really funny and every time you'd go on you'd see a great joke. ... Having Twitter on your phone is like being with a journalist that hates you 24 hours a day. Anything you say on that can be spun. Truly, that's what you have to think of it as. Che: It's like walking around with the district attorney and everything you say is just going to the district attorney.